How Tales of ‘Flippers’ Led to a Housing Bubble: There is still no consensus on why the last housing boom and bust happened. That is troubling, because that violent housing cycle helped to produce the Great Recession and financial crisis of 2007 to 2009. We need to understand it all if we are going to be able to avoid ordeals like that in the future. By now, the notion of getting rich by flipping houses is entrenched. I searched Amazon for books on “flipping houses” and came up with 325 hits, most written in the past few years..., many of these books make extravagant pitches and seem aimed at inspiring amateurs to plunge into risky ventures. Darwin Visits Wall Street, by Peter Dizikes, MIT News: If you have money in the stock market, then you are probably anticipating a profit over the long term — a rational expectation given that stocks have historically performed well. But when stocks plunge, even for one day, you may also feel some fear and want to dump all those stress-creating equities. Why regulators should focus on bankers’ incentives: Last autumn, Charles Goodhart gave a special lecture at the Bank. In this guest post he argues that regulators should focus more on the incentives of individual decision makers. If a bank CEO knew that his own family’s fortunes would remain at risk throughout his subsequent lifetime for any failure of an employee’s behavior during his period in office, it would do more to improve banking ‘culture’ than any set of sermons and required oaths of good behavior. The root of the problem is the bad behavior of bankers, not of banks, who are incapable of behavior, for good or ill. The regulatory framework should be refocused towards the latter, with a focus on reforming incentives. Fed Watch: Is Bank Lending A Concern? What can Nobel-winning contract theory teach us about regulating banks? 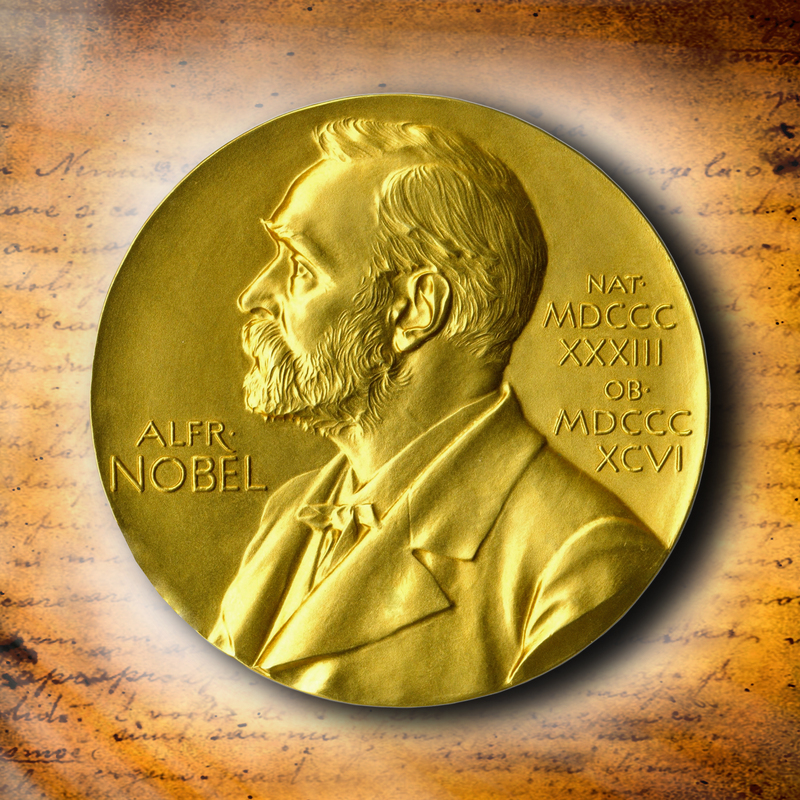 : The 2016 Nobel Prize in economics has been awarded to Professors Oliver Hart and Bengt Holmström for their contributions to contract theory. The theory offers a wide range of real-life applications, from corporate governance to constitutional laws. And, as the post will hopefully convince you, contract theory is also helpful in regulating banks! To this end, we will unpack the outline of the theory and apply it to a number of real-world conundrums: How to pay banks’ chief executives and traders? 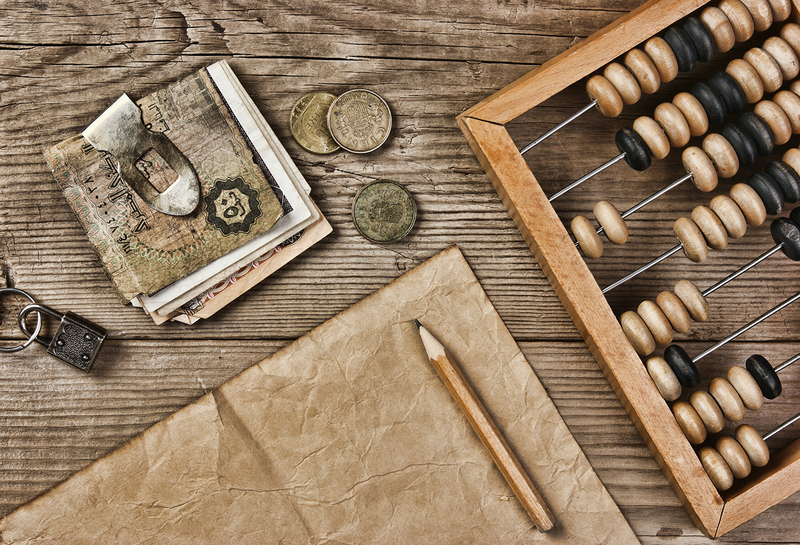 How to fund a bank’s balance sheet? How to regulate banks? The fed's bank bailout, EurekAlert! :...While many Americans know the Fed for its role in making monetary policy, it serves another lesser-known but hugely important purpose: providing temporary, short-term funds to banks as a "lender of last resort." For the first time, new research from Washington University in St. Louis examines data from the crisis to show how the Fed can effectively assist banks in times of financial uncertainty. No matter the program or the bank size, this infusion of liquidity spurred lending that ultimately reached homes and businesses, thereby benefiting the economy, the researchers found in their analysis. During the course of their research, Dlugosz and her co-authors [Allen Berger, professor of banking and finance at the University of South Carolina, Lamont Black, assistant professor of finance at DePaul University, and Christa Bouwman, associate professor of finance at Texas A&M University] found a total of 20 percent of small U.S. banks and 62 percent of bigger U.S. banks -- more than 2,000 in all -- used the Discount Window or the Term Auction Facility at some point during the crisis. The access to liquidity increased bank lending of almost all types. Meanwhile, they found no evidence that banks were making riskier loans. "We examined whether or not the Discount Window and the Term Auction Facility helped encourage banks to lend during the crisis," Dlugosz said. "We find that it did. It looks like one extra dollar in liquidity support from the Fed to a bank results in somewhere between 30 to 60 cents in additional lending by the bank, depending on its size. "It wasn't obvious at the time whether this was going to work. ..."
Why Dodd-Frank’s orderly liquidation authority should be preserved: The collapse of the investment bank Lehman Brothers in September 2008 was perhaps the defining event of the financial crisis. Lehman’s bankruptcy, followed by the near-collapse (save for government intervention) of the insurance company AIG, greatly intensified the fear and panic in markets, bringing the financial system and the economy to the brink of the abyss. These events, including the government’s response, remain controversial. What should not be controversial is that ordinary bankruptcy procedures were entirely inadequate for the situation. The bankruptcy judge in the Lehman case—required, by law, to focus narrowly on adjudicating creditors’ claims against the company—had neither the tools nor the mandate to try to mitigate the effects of the failure on the financial system or the economy. The Fed, FDIC, and Treasury used the powers available to them, often in ad hoc ways, to try to preserve broader stability. But these agencies likewise lacked a framework for dealing systematically with failing financial giants. ...Conclusion Recent experience has taught us that the uncontrolled collapse of a systemically important financial firm can do enormous damage to the broader financial system and the economy. The Dodd-Frank Act modified bankruptcy law to better accommodate large, complex financial firms, but also wisely provided a backstop framework—the Orderly Liquidation Authority of Title II—that can be invoked when overall financial stability is at stake. Critically, the OLA draws on the expertise and planning of the FDIC and the Fed. The OLA is not a bailout mechanism, since all losses are borne by the private sector. The government can provide temporary liquidity under OLA (as it probably would have to do under Title I, as well), but not permanent capital. Taxpayers are fully protected. To be sure, controversies remain over how effective in even a Title II resolution would be in the context of a significant financial crisis. Still, drawing in particular on the FDIC’s decades of experience in dealing with failing banks, a good bit of progress has been made. The tools provided by Title II are a significant advance over what was available during the recent crisis. Have we ended bailouts? Current lawmakers can’t bind future legislators, and we can’t guarantee that a future administration and Congress, fearful of the economic consequences of a building financial crisis, won’t authorize a financial bailout. But the best way to reduce the odds of that happening is to have in place a set of procedures to deal with failing financial firms that those responsible for preserving financial stability expect to be effective. That’s what the OLA is intended to provide. ...Bottom line: Jeb Hensarling's claims about the CFPB are based on a set of utterly concocted alternative facts. This is not the way we should be making policy. Trump Picks Wall Street Over Main Street: President Trump fired the first round in his war against financial regulations by signing two executive orders on Friday. Though they don’t do too much by themselves to roll back these reforms, the directives do offer important details on how Mr. Trump will approach the financial industry in the next four years — and provide three reasons that people on Main Street should be scared about how Mr. Trump will help Wall Street. Making America's risk of a financial crisis great again: In the decades prior to the financial crisis, the U.S. underwent a period of financial deregulation under the assumption that market forces would prevent financial institutions from taking excessive risk. In particular, the shadow banking system -- financial institutions that don’t operate as traditional banks -- was lightly regulated. However, as Alan Greenspan admitted in testimony on Capital Hill after the financial crisis, that assumption turned out to be wrong. The traditional banking sector, which is highly regulated, weathered the storm fairly well, but the shadow banking system came crashing down -- and brought the economy with it. Venetians, Volcker and Value-at-Risk: 8 Centuries of Bond Market Reversals: The economist Eugen von Böhm-Bawerk once opined that “the cultural level of a nation is mirrored by its interest rate: the higher a people’s intelligence and moral strength, the lower the rate of interest”. But as rates reached their lowest level ever in 2016, investors rather worried about the “biggest bond market bubble in history” coming to a violent end. The sharp sell-off in global bonds following the US election seems to confirm their fears. Looking back over eight centuries of data, I find that the 2016 bull market was indeed one of the largest ever recorded. History suggests this reversal will be driven by inflation fundamentals, and leave investors worse off than the 1994 “bond massacre”. CFPB Tales Told Out of School: Former CFPB enforcement attorney Ronald Rubin has a lengthy attack on the CFPB in the National Review. It's got lots of sultry details, but there's nothing new and verifiable in the piece. Instead, it's all tales told out of school, unverifiable personal anecdotes by Rubin, who seems to have an particular axe to grind with certain other CFPB staffers, and an ideological one too. Incredibly, Rubin, a former Managing Director for legal and compliance at Bear Stearns, holds up the oft-feckless SEC as a model of good enforcement practice, and criticizes the CFPB for any departures from that practice. Rubin's conclusions just don't follow from his non-verifiable personal evidence. Indeed, the very fact that the CFPB hired people like Rubin and Leonard Chanin seems to belie his claims of partisan hiring practices; Rubin is a guy who went from the CFPB to be a Republican staffer for the House Financial Services Committee, after all. Rubin's conclusions do follow from his anti-regulatory world view whose "primary influences were my business-school professors at the University of Chicago, the epicenter of free-market capitalism." Yup. The Comptroller’s proposed rule comes on the heels of a report it co-authored with the Federal Reserve and Federal Deposit Insurance Corporation, which contains several recommendations to ensure the separation of traditional banking activities from more commercial activities. The report specifically states that the Comptroller would publish a proposed rule about limits on trading copper. In the report, the Federal Reserve also recommends several other reforms that aim to “help ensure the separation of banking and commerce.” It proposes repealing a rule that allows bank holding companies to participate in commodities activities similar to those addressed by the Comptroller’s proposed rule for national banks and recommends strengthening standards for other commodity-related activities like trading derivatives. The report’s authors also recommend repealing authority for financial holding companies to participate in merchant banking activities like buying a stake of ownership in a company instead of providing a traditional loan. Evaluating Germany’s Success in Regulating High-Frequency Trading: ...Although many countries have attempted to regulate the meteoric rise of high-frequency trading, no plan has been more ambitious than Germany’s High-Frequency Trading Act (HFT Act). Rather than regulate trading speed alone, the HFT Act targets the complex core of high-frequency trading: financial algorithms. When asset managers go MAD: What do the Cold War powers of the United States and the USSR have in common with modern day asset managers? The capacity for mutually assured destruction. During the 1950s game theorists described a model of strategic interaction to demonstrate how it might be that two nations would choose to annihilate each other in nuclear conflict. Simply put, each nation had an incentive to strike first, as there was no incentive to retaliate. Both would race to push the button. Asset managers face a similar set of incentives. Does Wall Street Do ''God’s Work''? Or Even Anything Useful? Does Wall Street Do “God’s Work”? Or Even Anything Useful? : In the wake of the 2008 crisis, Goldman Sachs CEO Lloyd Blankfein famously told a reporter that bankers are “doing God’s work.” This is, of course, an important part of the Wall Street mantra: it’s standard operating procedure for bank executives to frequently and loudly proclaim that Wall Street is vital to the nation’s economy and performs socially valuable services by raising capital, providing liquidity to investors, and ensuring that securities are priced accurately so that money flows to where it will be most productive. The mantra is essential, because it allows (non-psychopathic) bankers to look at themselves in the mirror each day, as well as helping them fend off serious attempts at government regulation. It also allows them to claim that they deserve to make outrageous amounts of money. According to the Statistical Abstract of the United States, in 2007 and 2008 employees in the finance industry earned a total of more than $500 billion annually—that’s a whopping half-trillion dollar payroll (Table 1168). Is finance a powerful driver of growth? : Since the financial crisis the UK has experienced a period of weak productivity growth, weak investment coupled with a decline in credit to non-financial sectors of the economy. But there is debate about the direction of causality: did low growth and other structural factors mean firms and households wanted to borrow less – as argued by Martin Wolf? Or did the financial sector offer too few funds to the real economy in the wake of the crisis as banks tried to repair their balance sheets. Alternatively, the financial system may not be functioning properly in general, if much of the financial sector’s activity contributes little to the betterment of lives and efficiency of business – a point made by John Kay. Who Exactly Benefits from Too Big To Fail? : Neel Kashkari, president of the Federal Reserve Bank of Minneapolis, has revived discussion of the Too Big To Fail (TBTF) issue for large U.S. financial institutions. TBTF arises when the government and regulators fear that a bank’s failure would cause widespread damage to the financial system. Consequently, when a large bank or highly interconnected bank is on the verge of failure, the government steps in and prevents its collapse. When this happens, howls are heard that the government is “bailing out” equity and bond holders at taxpayer expense and that the proper action is to wipe them out. Why is having a bank labeled TBTF a problem? First, by being viewed as TBTF, a bank receives an insurance policy against default from taxpayers but does not pay a premium for this insurance. Second, being provided with this insurance creates moral hazard since bank management can undertake riskier activities and reap the higher returns while shifting the risk of default to the taxpayer. Note that the first benefit occurs even if the bank does not change the risk structure of its balance sheet—e.g., even if it does not engage in moral hazard. Thus, it is important to keep in mind that having TBTF status is not just about moral hazard. It is also about the provision of free insurance to the bank by the taxpayer. This latter point is often overlooked in discussions of TBTF. But, as heretical as it may sound, are the current equity holders and bank creditors the true beneficiaries of the bailout? The answer depends on whether or not the TBTF designation for a bank was accounted for in its equity and debt prices at an earlier date. If a bank is declared TBTF unexpectedly at the moment it is about to default, then equity and bond holders are bailed out since their asset positions did not price-in this status at the time of purchase. However, what if the TBTF designation was given prior to default? Looking back at the financial crisis, this seems to be the more-relevant case. Ron Feldman and Gary Stern warned about banks having this designation in their 2004 book, Too Big to Fail: The Hazards of Bank Bailouts, and the risks it created for the U.S. taxpayer. They point out that the failure of Continental Illinois in 1984, the seventh largest bank in the U.S. at the time, and the government’s generous treatment of unsecured creditors brought TBTF front and center into the public policy arena. Feldman and Stern succinctly summarize the TBTF problem: “The roots of the TBTF problem lie in creditors’ expectations...and the source of the problem is a lack of credibility” that the government will let them fail. Thus, the problem with TBTF is that a bank is viewed this way long before it actually gets into trouble. It is exactly this timing that makes it difficult to determine who benefits from TBTF. To make this scenario as stark as possible, suppose the government knows that its promises to let bank A fail are not credible. So the government simply announces at date t that bank A is too big to fail and will be bailed out if it is on the verge of default. What will happen at the time of this announcement? Bank A’s equity price will increase to reflect the absence of default risk associated with this new designation. Fur­thermore, the price of the bank’s outstanding debt and its newly issued debt will increase to reflect the elimination of default risk. But what about those who buy bank A stocks and bonds after the announcement? If financial markets are efficient, then the TBTF status should be fully capitalized into the value of the bank. As a result, a risk-neutral investor would be indifferent between (i) buying the stock at a low price without TBTF protection and (ii) buying the stock at a higher price but with TBTF status. In short, new buyers are paying for the TBTF insurance via higher equity and bond prices. They do not receive a windfall from the TBTF status assigned to bank A.
where i is the discount rate used by all investors. Note that the bond price reflects the probability of default. But what about the buyers of bank A equity after the announcement? As we can see, they paid a much higher equity price in response. Again, they are paying for the default protection.4 The equity holders at the time of the announcement are the ones who reap the rewards of the TBTF status. A similar argument applies to equity holders. The initial stock holders wouldn’t care. They reaped their capital gains by selling their shares to new buyers. But a shareholder who bought shares at êt would again argue that they paid for the default protection. They would not be happy if they are told it’s “fair” that they should be wiped out ex post. If someone held a share of bank A stock prior to the time of the announcement until the government allowed them to fail, then they would receive no capital gain and would be wiped out appropriately since they paid et not êt. This seems to be the view of those opposed to bailing out equity holders: that those holding equity at the time of bank A’s failure were the same ones holding equity when the TBTF status was announced. Moral hazard is a separate issue and an important one. But a similar logic applies. Bond holders care only about the default insurance. They do not reap the additional earnings from the riskier portfolio. Suppose the government sold a credit default swap (CDS) to potential buyers of bank A’s debt. They would be willing to pay p̂t > 0 for the CDS and nothing more. Is this enough to compensate the government for taking on this risk? Most likely not, since under moral hazard the risk of default increases, say, to π̄ > π. But this is not the new bondholders’ problem. It’s a problem between the government and the equity owners. To summarize, the value of being designated TBTF is capitalized into the price of a firm’s equities and its bonds. TBTF provides a windfall capital gain to shareholders and creditors at the time of the designation. But after that, new buyers of equities and debt are paying for that status. Con­sequently, determining who gets “bailed out” when an institution is TBTF is a more complicated task than it appears. If the government is unable to commit to letting banks fail or breaking them up is not a serious option, then the best that can be done is compensate taxpayers for the default insurance it provides to large financial institutions. Minneapolis Fed President Kashkari has advocated turning the banks into financial public utilities and regulating them accordingly. An alternative may be to have the government sell CDSs against the debt of large financial institutions. Debt holders would then pay the government directly for this insurance. Having the U.S. government sell insurance is already a common policy: The U.S. government currently sells crop insurance, flood insurance, disability insurance, etc. So it is not unprecedented. While this may not solve the moral hazard problem, it at least compensates taxpayers for providing default insurance. 1 The same logic applies to stock options of senior management. If the announcement of TBTF causes the equity price to jump high enough, then the strike price is below the market price of the stock, meaning senior executives are “in the money” and get a capital gain from their stock options. 2 Another way to think about this is to assume the government issues a credit default swap. If it sold the CDS on the market it would receive the premium p̂t – pt from the buyer of the CDS. If default does not occur, the taxpayer makes a profit from the CDS; if default does occur, the taxpayer is on the hook for the loss. Now suppose the government gives the CDS to the existing bondholders and lets them sell it. The current bondholders get the premium as a windfall profit without absorbing any risk. Meanwhile, the taxpayer gets zero if no default occurs and is on the hook for $1 if default occurs. The buyer of the CDS is not bailed out—he paid the fair market price for the insurance. 3 Since bond financing costs are lower, this would allow for a higher dividend payment after TBTF status is announced. Nevertheless, this is priced-in for new buyers of the equity. 4 Again, senior managers who join bank A after the TBTF designation now face a higher strike price for their stock options, which effectively lowers their executive compensation. 5 This applies even if the government could credibly remove the TBTF status of bank A. 6 This line of reasoning also applies to many situations. For example, consider the mortgage interest rate deduction. Many argue that it is a subsidy to homeowners and should be eliminated. However, the deduction has now been capitalized into the price of the house so a new owner would actually take a capital loss if the deduction was removed. Again, new homeowners have paid for the subsidy and get very angry when elimination of the mortgage interest deduction is discussed. 7 See Javier Bianchi’s “Efficient Bailouts” (forthcoming in American Economic Review; https://www.minneapolisfed.org/research/wp/wp730.pdf) for an excellent attempt at quantifying the moral hazard problem in banking. Bianchi’s main finding is that moral hazard is not quantitatively important if bailouts are systematic as opposed to being focused on a particular bank. The idea of cyclical regulatory equilibrium in financial markets is not new, as Blinder immediately admits. In a 2009 paper, Joshua Aizenman wrote that “prudential” under-regulation may expose economies to future financial crises, which means that over-regulation may be the correct course8). And, of course, Blinder also borrows from the “Minsky cycle”: Hyman Minsky’s idea that periods of financial stability encourage further and further risk-taking, even with borrowed money, until a phase–a “Minsky moment”–where asset values collapse. Impact of the ‘great bailout’: Evidence from car sales, by Efraim Benmelech, Ralf R Meisenzahl, Rodney Ramcharan: Nearly a decade since it took place, the US federal government’s rescue of the financial system in 2008-2009 remains highly controversial. At the time, the Troubled Asset Relief Program (TARP), which injected equity into commercial banks and provided for the bailout of the General Motors Acceptance Corporation (GMAC) — the lending arm of General Motors— and the US automobile sector, was initially rejected by Congress as a ‘bailout to bankers’. And even today, populists on both the right and the left echo a similar refrain, as economic growth remains tepid while asset prices boom. Moreover, nuance and careful research by highly respected economists observe that more aggressive intervention to relieve the household debt burden might have made for a stronger economic recovery (Mian and Sufi 2014). It remains an open question, then, whether the government’s rescue of the financial sector helped the US economy beyond Wall Street. Or was the government’s focus on the financial sector fundamentally misplaced? How bank networks amplify financial crises: Evidence from the Great Depression, by Kris James Mitchener and Gary Richardson: How financial networks propagate shocks and magnify recessions is of interest to both scholars and policymakers. The financial crisis of 2007-8 convinced many observers that financial networks were fragile, and while reforms are underway, much remains to be learned about how and why connections between financial firms matter for the macroeconomy. Indeed, the complexity and sheer number of linkages has made it particularly challenging to formulate empirical estimates of their role in amplifying downturns. Ending "Too Big to Fail": What's the Right Approach? To a first approximation, that’s what the government’s approach aims to do. For example, the capital surcharge and similar regulations directed at systemically important institutions act like taxes on size and complexity. ... That is, the extra costs that regulators impose on systemic institutions force their decisionmakers to “internalize the externality” that their firms create for the financial system. Similarly, the development of the liquidation authority (which raises the probability that creditors will take losses) and improvements in the overall resilience of the financial system (which would reduce any incentive that future regulators might have to try to engineer a bailout) should reduce the perceived benefits associated with TBTF status, as measured in terms of funding costs, for example. Putting creditors at risk also brings market discipline back into play, putting additional pressure on managers not to take excessive risks. Together with the requirements imposed by the living will process, better incentives for managers, shareholders, and creditors should lead, over time, to a banking system that is safer, but also more competitive and efficient. To some, the idea that the U.S. government isn't issuing enough debt may seem counterintuitive -- after all, federal debt outstanding has more than doubled over the past 10 years. But scarcity is not about supply alone. In the wake of the financial crisis, households and businesses are demanding more safe assets to protect themselves against sudden downturns. Similarly, regulators are requiring banks to hold more safe assets. Market prices tell us that the government needs to produce more safety in order to meet this increased demand. No private entity would behave like this. Imagine a corporation with such a safe cash flow and such low borrowing costs. It would issue debt to fund expansions or payouts to its shareholders. Analogously, the U.S. government should issue more debt, using the proceeds to invest in infrastructure, cut taxes or both. Instead, political forces have imposed artificial constraints on debt -- constraints that punish savers, choke off economic growth and could sow the seeds of the next financial crisis. At this point there are three candidates who have a serious chance of receiving their party’s presidential nomination. ... So what do we know about their economic policy skills? On the other side, I doubt that anyone will be shocked if I say that Mr. Trump doesn’t know much about economic policy, or for that matter any kind of policy. He still seems to imagine, for example, that China is taking advantage of America by keeping its currency weak — which was true once upon a time, but bears no resemblance to current reality. Oh, and coping with crisis in the modern world requires a lot of international cooperation. Things like currency swap lines... How well do you think that kind of cooperation would work in a Trump administration? Mr. Cruz is ... utterly divorced from reality and impervious to evidence... A financial crisis with him in the White House could be, let’s say, an interesting experience. Putting the Client Last: A Former Investment Banker Explains How Clients are Being Systemically Sucker-Punched: As a former London employee of a major investment bank, I am often puzzled by the tone that top managers of investment banks use when speaking to the public. There is indeed a striking gap between the official communication and the internal behaviors I have observed (and taken part in). To me, banks are experts at exploiting asymmetries of information. Furthermore, they often amplify this asymmetry themselves by complexifying the products they offer or by disclosing only fractions of the information they have. Our review and analysis of previous work suggests several conclusions. First, the extreme arguments on both sides are overstated. At the very least, the notion that a FTT is unworkable should be rejected. ... On the other hand, the idea that a FTT can raise vast amounts of revenue ... is inconsistent with actual experience with such taxes. Second, a wide range of design issues are critical to the formulation of a FTT... Third, although empirical evidence demonstrates clearly that FTTs reduce trading volume, as expected, it does not show how much of the reduction occurs in speculative or unproductive trading versus transactions necessary to provide liquidity. The evidence on volatility is similarly ambiguous: empirical studies have found both reductions and increases in volatility as a result of the tax. Fourth, the efficiency implications of a FTT are complex, depending on the optimal size of the financial sector, its impact on the rest of the economy, the structure and operation of financial markets, the design of the tax, and other factors. Charge senior bank bosses, says former commissioner, by Ben McLannahan, FT: Phil Angelides uncovered evidence of widespread fraud and corruption in the US mortgage market as chairman of the commission which produced the government report on the global financial crisis. Five years on, he is asking the Department of Justice why it has yet to call any senior bank executives to account. ... In a letter to Loretta Lynch, US Attorney General, Mr Angelides has challenged the DoJ to take action before the ten-year statute of limitation expires. Rescuing a SIFI, Halting a Panic: the Barings Crisis of 1890, Bank Underground: The collapse of Northern Rock in 2007 and Bear Sterns, Lehman Brothers, and AIG in 2008 renewed the debate over how a lender of last resort should respond to a troubled systemically important financial institution (SIFI). Based on research in the Bank of England Archive, this post re-examines a crisis in 1890 when the Bank, supported by central bank cooperation, rescued Baring Brothers & Co. and quashed a banking panic and a currency crisis, while mitigating moral hazard. This rescue is significant because it combined features similar to those mandated by recent U.K., U.S., and European reforms to ensure an orderly liquidation of SIFIs and increase the accountability of senior management (e.g. Title II of the Dodd-Frank Act (2010); the U.K. “Senior Managers Regime”). The rescue package provided to Barings was modelled on the 1889 rescue of the Comptoir d’Escompte. This commercial and investment bank had supported an effort to corner the copper market with loans and vast off-balance sheet guarantees of forward contracts. When copper prices fell, the Comptoir’s president committed suicide, prompting a run. The Banque de France provided loans of 140 million francs to meet withdrawals and, co-operating with the Minister of Finance, formed a bankers’ guarantee syndicate to absorb the first 40 million francs of losses. Contributions were assigned according to banks’ ability to pay and their role in the crisis, measured by how closely they were tied by interlocking directorships to the Comptoir. In addition, substantial fines and clawbacks were imposed on the directors and senior management. The run on the Comptoir abated and spread no further. A “good bank”, the Comptoir National d’Escompte, was recapitalized, while the Banque de France took over the liquidation of the toxic copper assets (Hautcoeur, Riva & White (2014)). The Barings rescue or “lifeboat” was announced on Saturday November 15, 1890. The Bank of England provided an advance of £7.5 million to Barings to discharge their liabilities. A four-year syndicate of banks would ratably share any loss from Barings’ liquidation. The guarantee fund of £17.1 million included all institutions, and some of the largest shares were assigned to banks whose inattentive lending had permitted Barings to swell its portfolio. The old firm was split into a recapitalized “good bank”, Baring Brothers & Co. Ltd., which took over the still profitable trade finance and a “bad bank” that retained its name and its toxic assets, managed by the Bank of England. This new research reveals that the two most important central banks of the late nineteenth century did not exclusively adhere to Bagehot’s rule. While the Bank of England and the Banque de France responded to panics by lending freely at high rates on good collateral, they also intervened to rescue deeply distressed SIFIs. Central bank cooperation to obtain liquidity and coordination with the Treasury were then critical to ensure that toxic assets were liquidated in an orderly fashion to minimize losses. Combined with penalties levied on the responsible principals, they were strikingly bold and successful rescues. While one may object that recent crises erupted because of system-wide incentives to take risk (Too Big To Fail, deposit insurance and flawed governance), these two episodes should be thought of as identifying appropriate policies to manage individual troubled SIFIs if the system-wide incentives can be brought under control. Market Bubbles: What Goes Up Doesn't Always Come Down, by Matt Nesvisky, NBER Digest: The great majority of booms during which market values doubled in a single year were not followed by crashes wiping out those gains. Do market booms inevitably result in busts? History suggests not, according to William N. Goetzmann in Bubble Investing: Learning from History (NBER Working Paper No. 21693). A dramatic market rise followed by an equally spectacular fall, such as a doubling in prices that is followed by a halving in value, is often regarded as a bubble followed by a bust. Seeking out such events, Goetzmann analyzes returns for 42 stock markets around the world from 1900 through 2014. He finds that bubble-and-bust episodes are uncommon, and urges caution in drawing conclusions from the widely-reported and discussed great bubbles of history. Conditional upon a market boom amounting to a stock price increase of 100 percent or more in a three-year period, crashes gave back prior gains only 10 percent of the time. Market prices were more likely to double again following a 100 percent price boom. 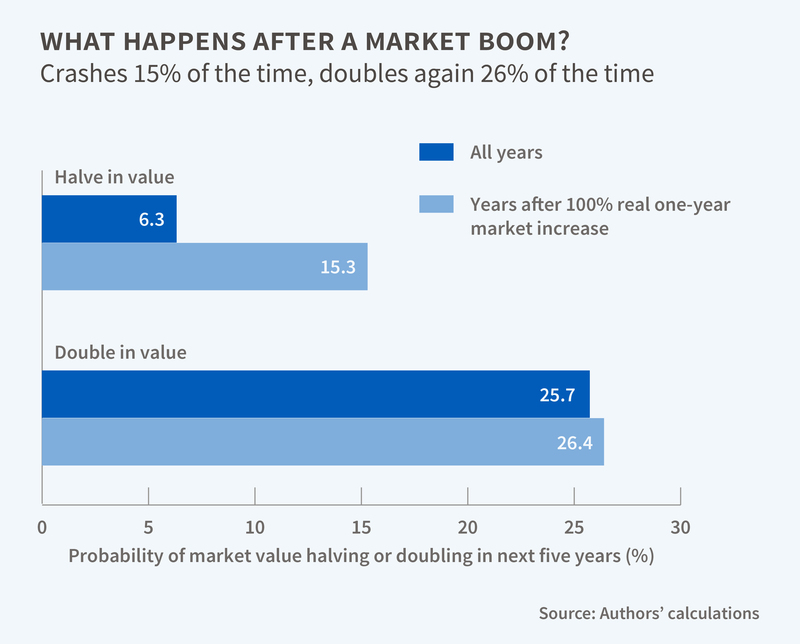 The frequency of a market crash over a five-year period is significantly higher when that market has just experienced a boom, but the frequency of doubling over the next five years is not much affected by whether a market has recently boomed. Thus a boom does raise the probability of a crash, but the probability of a crash remains low. Probabilities of a crash following a boom in which prices doubled in a single calendar year were also higher, however the great majority of such extreme events were not followed by crashes that wiped out those gains. Goetzmann suggests that his findings are relevant for regulators who are considering the desirability of deflating bubbles. If bubbles are often associated with investment in promising, albeit risky, new technologies, then when considering policies that may deflate them, policy-makers may face a trade­off between staving off a financial crisis and encouraging fruitful investment. They may evaluate this trade-off differently if the probability of a crash following a boom is low rather than high. Private Profit with Public Guarantee: The Real Issue with Fannie and Freddie: The NYT had a column by Jim Parrot and Mark Zandi on reforming Fannie Mae and Freddie Mac. ... The article argues that the problem with Fannie Mae and Freddie Mac was that they were considered too big to fail. It therefore puts forward the case for ending their monopoly on issuing government guaranteed mortgage-backed securities (MBS). This was a direct result of the perverse incentives created by a system where private shareholders and top executives stood to profit by passing risk off to the government. This incentive does not exist today. ... As long as Fannie and Freddie are essentially public companies, that do not offer high returns to shareholders and pay outlandish salaries to CEOs, no one has incentive to take excessive risks. This changes if we allow private banks to issue mortgage backed securities with the guarantee of the government. This would mean that Goldman Sachs, Citigroup and the rest would be able to issue the same sort of subprime MBS they did in the bubble years with assurance that even in a worst case scenario the government would reimbursement investors for almost the full value of their investment. This is a great recipe for pumping up financial sector profits and another housing bubble. It does not make sense as public policy. In a financial panic, providers of short-term funding to financial institutions refuse to renew their lending, out of fear that an institution might fail. ... When banks or other financial firms cannot obtain funding, they ... stop extending credit to households and businesses, which can bring the economy to a halt. My biggest concern about the collective impact of the reforms is related to what economists call the stigma of borrowing from the central bank. For lender-of-last resort policies to work, financial institutions have to be willing to avail themselves of the central bank’s loans. If they fear that by doing so that they will be identified by the marketplace as weak, and thus subject to even more pressure from creditors and counterparties, then they will see borrowing from the Fed as counterproductive and will stay away. This is the stigma problem... Deprived of access to funding, financial firms will instead hoard cash, dump assets, cut credit, and call in loans, with bad effects on the whole economy. The Euro Debate and the Abuse of Language: Defenders of the Eurozone’s initial design, subsequent management and purported reform invariably refer to the system as a ‘monetary union’. So do academic commentators including the authors of the recent Vox piece on the origins of the crisis. Whether intended or unconscious, this is an abuse of language. When the Continental Illinois Bank went under in 1984, at the time the largest-ever US bank failure, the state of Illinois was not expected to handle the fall-out. ... The USA is also a monetary union and there is federal responsibility for bank supervision, bank resolution and the protection of bank creditors. Language matters. ... The danger is that relentless description of the Eurozone as a monetary union deflects attention from the awkward truth that it is not, and from the political unwillingness to make it so. Democrats, Republicans and Wall Street Tycoons, by Paul Krugman, Commentary, NY Times: Hillary Clinton and Bernie Sanders had an argument about financial regulation during Tuesday’s debate — but it wasn’t about whether to crack down on banks. Instead, it was about whose plan was tougher. The contrast with Republicans like Jeb Bush or Marco Rubio, who have pledged to reverse even the moderate financial reforms enacted in 2010, couldn’t be stronger. Many liberals feel that the Obama administration was far too lenient on the financial industry in the aftermath of the crisis. ... But the financiers didn’t feel grateful for getting off so lightly. ... Financial tycoons loom large among the tiny group of wealthy families that is dominating campaign finance this election cycle — a group that overwhelmingly supports Republicans. Hedge funds used to give the majority of their contributions to Democrats, but since 2010 they have flipped almost totally to the G.O.P. ... Wall Street insiders take Democratic pledges to crack down on bankers’ excesses seriously. And it also means that a victorious Democrat wouldn’t owe much to the financial industry. The China Debt Fizzle, by Paul Krugman: Remember the dire threat posed by our financial dependence on China? A few years ago it was all over the media, generally stated not as a hypothesis but as a fact. Obviously, terrible things would happen if China stopped buying our debt, or worse yet, started to sell off its holdings. Interest rates would soar and the U.S economy would plunge, right? Indeed, that great monetary expert Admiral Mullen was widely quoted as declaring that debt was our biggest security threat. Anyone who suggested that we didn’t actually need to worry about a China selloff was considered weird and irresponsible. Well, don’t tell anyone, but the much-feared event is happening now. As China tries to prop up the yuan in the face of capital flight, it’s selling lots of U.S. debt; so are other emerging markets. And the effect on U.S. interest rates so far has been … nothing. Who could have predicted such a thing? Well,... anyone who seriously thought through the economics of the situation ... quickly realized that the whole China-debt scare story was nonsense. But as I said, this wasn’t even reported as a debate; the threat of Chinese debt holdings was reported as fact. And of course those who got this completely wrong have learned nothing from the experience. The decision about whether to prosecute individuals wasn't up to him, [Bernanke] says. "The Fed is not a law-enforcement agency," he says. "The Department of Justice and others are responsible for that, and a lot of their efforts have been to indict or threaten to indict financial firms. Now a financial firm is of course a legal fiction; it's not a person. You can't put a financial firm in jail." Asked if someone should have gone to jail, he replied, "Yeah, I think so." There's a video of the interview at the first link. ... Many regulators and bankers contend that the thousand-page Dodd Frank Act complicated the task of a future panic rescue by compromising the independence of the Fed. Next time the Treasury Secretary will be required to sign off on emergency lending. Bank Regulators? Some economists, including Gorton, worry that by focusing on its new “liquidity coverage ratio” the Bank for International Settlements, by now the chief regulator of global banking, will have rendered the international system more fragile rather than less by immobilizing collateral. Bankers? You know that the young ones among them are already looking for the Next New Thing. Meanwhile, critics left and right in the US Congress are seeking legislation that would curb the power of the Fed to respond to future crises. So there is plenty to worry about in the years ahead. Based on the experience of 2008, when a disastrous meltdown was avoided, there is also reason to hope that central bankers will once again cope. Remember, though, as the Duke of Wellington said of the Battle of Waterloo, it was a close-run thing. Update: See Brad Delong's reply. ...IMF Survey: In pushing the envelope, you also hosted three major Rethinking Macroeconomics conferences. What were the key insights and what are the key concerns on the macroeconomic front? As a result of the crisis, a hundred intellectual flowers are blooming. Some are very old flowers: Hyman Minsky’s financial instability hypothesis. Kaldorian models of growth and inequality. Some propositions that would have been considered anathema in the past are being proposed by "serious" economists: For example, monetary financing of the fiscal deficit. Some fundamental assumptions are being challenged, for example the clean separation between cycles and trends: Hysteresis is making a comeback. Some of the econometric tools, based on a vision of the world as being stationary around a trend, are being challenged. This is all for the best. Virtual Frenzies: Bitcoin and the Block Chain: Bitcoin has prompted many people to expect a revolution in the means by which we make and settle everyday payments. Our view is that Bitcoin and other “virtual currency schemes” (VCS) lack critical features of money, so their use is likely to remain very limited. So, what’s the bottom line? We share with Bitcoin advocates the desire to protect privacy (see, our post on paper money), but remain skeptical about the potential for any private currency – digital or otherwise – to do the job better than what we currently use. And the evidence so far is that government fiat monies – dollar, euro, yen, or whatever – are far more stable than Bitcoin. Not only that, but if there’s to be profit from issuing a currency, then we believe that it is the public that should benefit. As for the block chain, there’s plenty of room for experimentation – with the potentially greatest benefits coming where the current payments system is the least developed. But it remains to be seen whether the public ledger can compete against the big clearinghouses that dominate wholesale payments and settlement, and whether it can ensure payments providers have the ability to reliably filter out illegitimate transactions. Of course, even a big clearinghouse might find the block chain technology useful (see WSJ-gated story here). Wouldn’t it be ironic if it did so, but wished to keep the innovation private?